Designed in center Viet Nam to make visitors feel like they're taking a stroll on a shimmering thread stretching across the hands of gods for a panorama view of Danang. 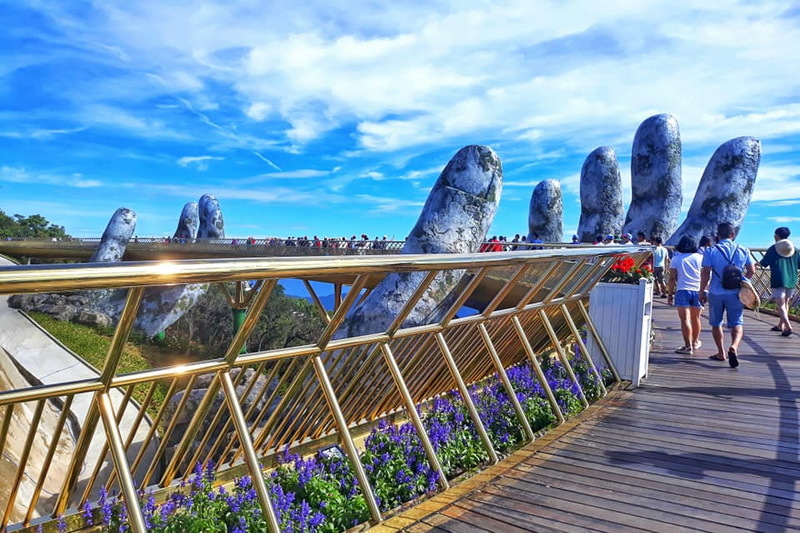 The "Golden Bridge" has attracted hundred travelers since it opened in June 2018. It is a spectacular architecture not only in Viet Nam but world known since CNN, BBC and other channels talking about it. At 150 meters long (490 feet), the bridge snakes through the forest high up in mountains first developed by French colonists as a hill station in 1919. Not only the Golden Bridge, but also visitors will explore French medieval village - including faux castle and cathedral - manicured gardens and a wax museum featuring statues of Lady Gaga and Michael Jordan. In November, there is some good news in some flight routes and transport which help transfer more and more people to Vietnam and enjoy its charming beauty. The visa exemption will be extended to 5 years, the staying period in Vietnam up to 30 days, which will help attract Western tourists to Vietnam.